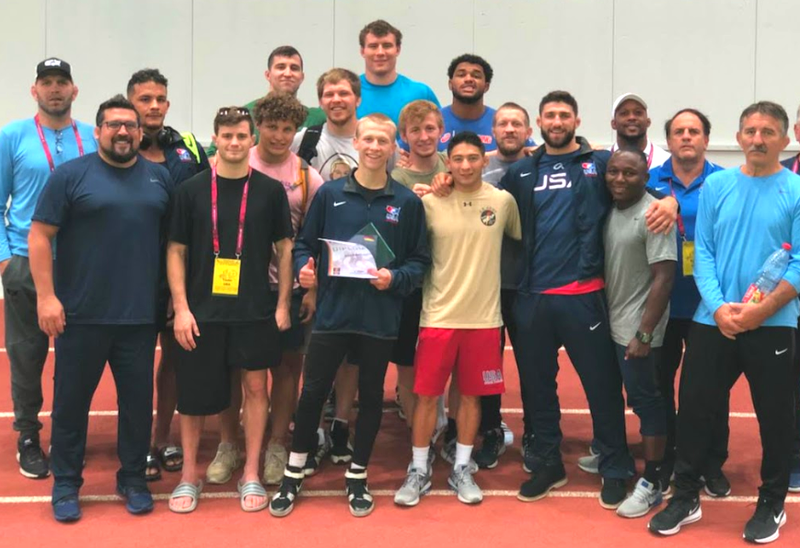 The entire point of Team USA Greco-Roman’s participation in the 2018 Grand Prix of Germany was to identify areas in need of improvement prior to the World Championships just over two months from now in Budapest, Hungary. This weekend’s tournament, a “test event”, a dry run of sorts intended to shake off some rust or provide injections of encouragement, was never meant to be dissected and discussed at length. However, following a second day of action in Dortmund that saw five US Seniors fail to put a tick in the win column, you can rest assured that this coming week’s training camp will certainly include a higher number of items to work on than was perhaps previously anticipated. That isn’t to suggest the morning was completely bereft of bright spots. 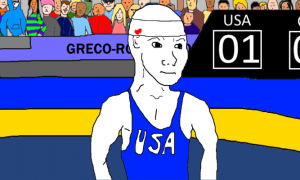 Even in defeat, 2018 World Team member Dalton Roberts (60 kg, NYAC/OTS) exhibited the same degree of fight that has followed each step of his career. As is custom, he threw the kitchen sink at his more polished opponent. The result just didn’t meet Roberts’ liking. 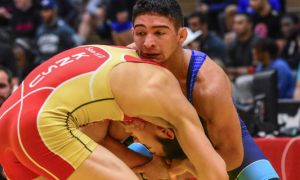 Fellow World Teamer Patrick Martinez (87 kg, NYAC) seized on an early opportunity and looked to be in prime position to earn his third overseas medal of the season. Trials runner-up and 2012 World Champion Max Nowry (55 kg, Army/WCAP) also scrapped tirelessly in his bid to make the podium. But overall, Sunday’s conclusion of the 2018 Grand Prix of Germany brought with it more lessons to be learned than reasons to celebrate. A clash of styles defined the 60-kilogram final where intense firebrand Roberts greeted the stoic and steady Erik Torba of Hungary. 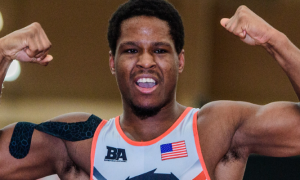 Torba, a Junior World bronze medalist three years ago as well as Hungarian Grand Prix bronze this season, defeated the US’ Taylor LaMont (Sunkist) on Saturday en-route to sealing his spot in Sunday’s gold medal round. Roberts rushed forward to begin, pressuring towards Torba, who played back inside. The NMU wrestler then dashed for an arm throw but it was ruled a slip. The pace was set. Roberts was justly awarded the first passivity chance of the bout and locked for a lift. As he went to bring it over the lock got loose, allowing Torba to essentially reverse position for a point. Back standing and Torba was there with an arm throw that curiously netted four, plus another two. The scoreboard read 7-2 in Torba’s favor entering the break, but by all appearances, Roberts was still in the running. The same degree of urgency escorted Roberts onto the mat for the conclusive period. The exchanges were about equal, with the American seemingly exerting more energy fighting in the tie-ups than his opponent. Nevertheless, Torba remained in control and briefly off-balanced a charging Roberts, who responded by bounding back up for a headlock attempt. The try was ruled a slip leading to another restart. Roberts crashed in once more, only when he made contact and subsequently broke away, he was too close to the line and inadvertently stepped out. Eventually, Roberts found a front headlock, though the action was restarted before he ever had an opportunity to work from the position. The whistle blew soon enough with Torba holding on for the victory by a score of 8-2. The loss provides 2018 World Team member Roberts with his second silver medal of the season. 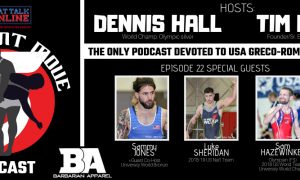 He earned a gold in Russia in late-2017, a bronze at Cuba’s Granma Cup in February, and was a runner-up at the Bill Farrell Memorial this past March. On Saturday at the German Grand Prix, World Team Trials runner-up Max Nowry (55 kg, Army/WCAP) and Fabian Schmitt (GER) met in Pool A competition with the Army athlete cruising to a 5-1 decision victory that included a few heated exchanges late in the bout. Sunday morning offered a different type of energy, and it was one that did not work out well for Nowry. Nowry began the contest prodding in the ties and working a two-on-one. Despite his intent to use the hold, the referee decided he was eligible for passivity. Schmitt pounced on his good fortune and locked Nowry as he set to lift. He eventually settled for a gutwrench, and then another. Next, he coerced Nowry off the edge for another point and surged to a 6-0 lead that stayed put into the second period. In the second frame, Nowry repeatedly found himself latching onto front headlocks, one of the featured weapons in his arsenal. He goes to the maneuver both to score and also to sap the life out of opponents. After a few tries, Nowry finally torqued a front headlock enough to force Schmitt off the line for his first point of the match. Following the reset, Nowry pulled another front headlock with his back to the edge for two more, cutting his deficit to 6-3. This kicked off a race to the buzzer with Nowry flashing in for last-gasp looks at the body, but nothing was doing. Schmitt gains a measure of revenge from Saturday with the 6-3 win, giving Nowry a fourth-place finish. 2016 Junior World bronze and a member of the US Junior squad again this year, LaMont was in Germany to update his international seasoning. 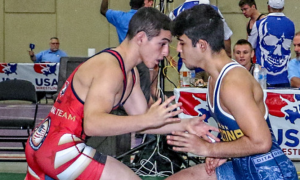 Standing in the repechage round was a suitable test in Ardit Faziljija of Sweden, who was awarded “Best Technician” at this year’s Junior Greco World Duals in California. LaMont, who aside from boasting superb athletic gifts can brawl with the best of them, was unable to come roaring out of the gate. That’s because Faziljija stole all of the momentum early, first with an arm throw attempt that scored four, and then with a follow-up gut that yielded another pair of points. Quickly, LaMont was staring down the barrel of a 6-0 deficit that would grow out of reach shortly into the second period. Soon after the break, LaMont was (hurriedly) banged for passivity. The penalty represented the beginning of the end. From top, Faziljija hastily locked a gut and rolled it over for the match-ending points. 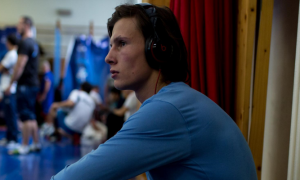 “The Lone Wolf” got off to a fast start against Aleksandar Stjepanetic (SWE), who had defeated two-time Trials winner Joe Rau (Chicago RTC) on Saturday. Stjepanetic locked around Martinez and went to arch back — and Martinez instantly adjusted to land on top, holding him right there looking for the fall. When Stjepanetic found daylight and rolled to his stomach, Martinez wasted no time and gutted him over for another pair of points. It was 4-0 just like that. After the restart, Stjepanetic was knocked for passivity, but Martinez couldn’t get a turn and they were back on the feet. Things unraveled for Martinez in the second. It started with passivity. From par terre top, Stjepanetic looped a front headlock that he was able to crank enough to pick up two with before Martinez ambled out. Serious trouble didn’t betray itself right away. Martinez energetically tried digging his way inside. He was diligently looking to create workable positions. But it was Stjepanetic who would capitalize as he moved into over/under’s and dumped an eager Martinez to the surface for what was originally scored four — though a USA challenge that was upheld amended the tally to two. Still, the sequence put Stjepanetic ahead on criteria 5-5. Martinez did have enough space left in the period to make something happen and fought to the bell trying to do so. Ultimately, Stjepanetic was able to make it to the whistle without giving up any further damage, resulting in a 5-5 decision loss for Martinez, who finishes the Grand Prix of Germany in 15th place. Facing off against 2018 Thor Masters gold medalist Roland Schwarz (GER) in the first repechage bout, Speiller immediately demonstrated that he was the quicker, more explosive athlete between the two. Problem was, in the midst of an exchange Schwarz flicked an arm throw that yielded four, putting the American behind 4-0 early in the first period. Unfortunately for Speiller, the proceedings didn’t last too much longer. He dipped down for looks at lanes to the body, flashing those ducks that have a tendency to lead to big points. But following a brief exchange, Schwarz wrangled another arm throw and zipped it over for four more, ending Speiller’s run to bronze prematurely. Given the ability Speiller has at his disposal, it is expected that shoring up his defense to this maneuver will be a focal point throughout the next week, if not the remainder of the training cycle. 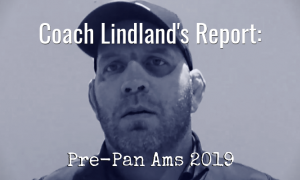 After the tournament wrapped up, US National Team head coach Matt Lindland was pleased with Roberts’ effort in the final, though he sees several technical and positional miscues in vital need of addressing for all involved as the group prepares for the next phase of the training phase this summer. The Team USA Seniors entered Sunday with five athletes alive for medals, including one going for gold (Roberts). They went 0-5, not counting LaMont’s forfeit. The exceedingly-talented Speiller gave up a surprising total of 14 points to his opponents at the Grand Prix of Germany with 12 coming via arm throw. 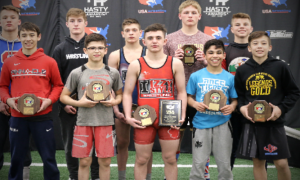 With the exception of Senior World Teamers Sam Hazewinkel (55 kg, Sunkist) and Kamal Bey (77 kg, Sunkist), as well as LaMont, the US Seniors will stay put in Germany throughout the next week for an international training camp. Additional follow-up coverage of the Grand Prix of Germany will be available in tomorrow’s Monday Roundup.